I’ve finally found my first VR experience that I just don’t want to leave. 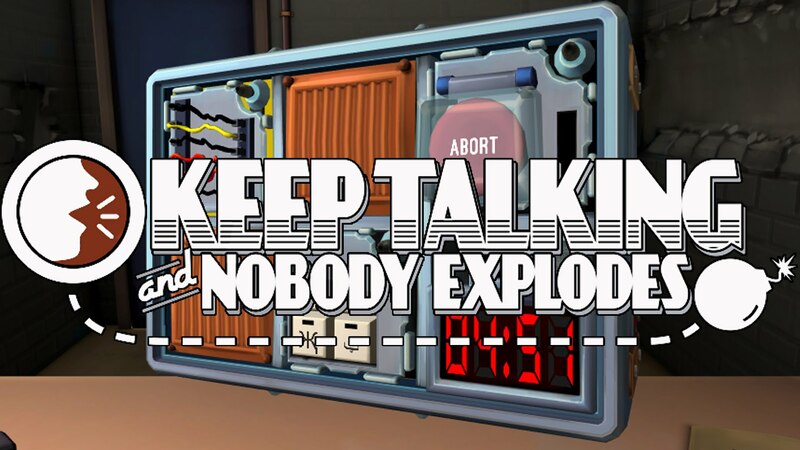 It’s a game called Keep Talking and Nobody Explodes, and they aren’t joking when they say to keep talking. Keep Talking is a MultiPlayer game with one player in the VR (the bomb defuser) and the other players in the real world (with a manual). The bomb defuser is locked in a room with a bomb. The bomb has a countdown, a limit to how many mistakes can be made, and an X number of modules. These modules range from colored wires to word games and from buttons to mazes. The catch is that the defuser doesn’t know how to solve any of them without the manual…which is in the hands of the real world people, and with constant communication, the two parties try to solve it all before the bomb explodes. The defuser can’t see the manual…and the manual readers can’t see the bomb. I’ve spent 7+ hours playing this over the last few days, and am immersed in the experience. Be sure you and the other players have good communication, and won’t get annoyed when you’re screaming at each other for failing at seemingly simple tasks.